SACRAMENTO, California, March 26, 2012 (ENS) – California Governor Jerry Brown Friday announced a $120 million dollar settlement with NRG Energy Inc. that will fund construction of a statewide network of charging stations for zero-emission vehicles. Included in the deal are at least 200 public fast-charging stations and another 10,000 plug-in units at 1,000 locations across the state, mainly in the San Francisco Bay Area, the San Joaquin Valley, the Los Angeles Basin and San Diego County. The settlement stems from California’s energy crisis of 2000, a situation in which California had a shortage of electricity caused by market manipulations and illegal shutdowns of pipelines by Texas energy consortiums. The state endured multiple large-scale blackouts, and one of the state’s largest energy companies collapsed. Drought, delays in approval of new power plants, and market manipulation decreased supply, causing an 800 percent increase in wholesale prices from April 2000 to December 2000. This settlement resolves 10-year-old claims against a subsidiary of Dynegy Inc. for costs of long-term power contracts signed in March 2001. NRG assumed full responsibility for resolving this matter in 2006 when NRG acquired Dynegy’s 50 percent interest in the assets. One hundred million dollars from the settlement will fund the fast-charging stations and the installation of the plug-in units and electrical upgrades, at no cost to taxpayers. The remaining $20 million will be directed to ratepayer relief. This new EV charging network is a breakthrough in encouraging consumer adoption of electric vehicles and California clean air officials hope it will contribute to achieving California’s clean car goals. In January, the Air Resources Board voted to require the largest automakers to derive 15 percent, or about 1.4 million, of their annual California sales from electric vehicles and other zero or near-zero emissions vehicles by 2025. 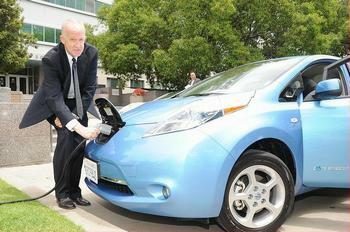 By 2050, virtually all personal transportation in the state will be based on zero-emission vehicles. By 2050, greenhouse gas emissions from the transportation sector will be reduced by 80 percent below 1990 levels, a goal set in an Executive Order signed by former Governor Arnold Schwarzenegger. AB 32, the 2006 Global Warming Solutions Act, calls for a 30 percent reduction of greenhouse gas emissions by 2020. Last year, Governor Brown signed into law a measure directing the California Air Resources Board to adopt regulations setting a 33 percent renewable energy target. Berkeley Lab runs the Batteries for Advanced Transportation Technologies program, a fundamental research program for developing high-performance, rechargeable batteries for electric and hybrid-electric vehicles supported by the U.S. Department of Energy Office of Vehicle Technologies.